To bring awareness to the fact that we rely so heavily on our refrigerators, the Freshpet #FridgeChallenge makes us take a step back and think about just how often we open the fridge door to pull something fresh, healthy, and nutritious out. When opening the fridge, we often do so without thinking about it while at the same time taking that scoop and reaching into the dog food and dishing out dry kibble for our dogs day in and day out. 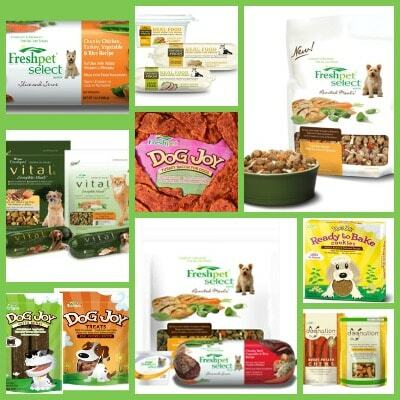 Freshpet already thought about that and said that our pets deserve fresh food too and have come up with a whole line of products for both cats and dogs. When Freshpet came knocking on our door – ok they didn’t knock on my door they emailed me I jumped at the chance to take the Freshpet #FridgeChallenge and talk about it with all of you. It is a unique idea and chance to take a long hard look at what our pets need and deserve. I realized just how often I go to the fridge and pull something out. In today’s world it is where we store our eggs, and dairy, and fruits and vegetables and fish and meat. We look at canned food as a thing of the past or a way to get dinner on the table quickly after work and running from soccer practice or piano lessons to karate. We don’t look at foods that store well outside of the refrigerator as all that healthy and nutritionally balanced for us. I bet like me many of you are probably scared of canning your own fruits and vegetables for use during the winter because what if you don’t do something right the food spoils or it makes you extremely sick when you go to eat it. In fact many people do not like to eat leftovers that have been in the fridge since the day before because they feel it isn’t fresh enough. I am the first to say that I feed my dogs dry food and I know that a lot of research went into ensuring that it is nutritionally balanced for them but I also do open up the fridge or freezer and take out special treats for them because I think they enjoy and need fresh fruits and vegetables too (we leave the fresh cooked meat to treats with grandpa). People often ask if I feed table food to my dogs and my answer is no. I don’t feed table food to my dogs but I do feed my dogs things that are not labeled as dog food because I think they deserve variety and freshness at least once in a while and in small quantities (meaning generally not enough to qualify as a meal). So how has the Freshpet #FridgeChallenge been for me? It has been difficult and I messed up a few times but overall it has been eye opening. It meant I couldn’t have eggs for breakfast and had to have cereal (dry, no milk), it meant that I either had to make something that could be stored at room temperature or leftovers frozen for when the challenge is over. The challenge meant that even things that I would normally start from a can like chili I couldn’t make the same way I normally would with frozen vegetables and fish. I also realized that a lot of things that have a long shelf life say refrigerate after opening. If I lived in a less humid climate or it was slightly cooler (it was still in the upper 70′s in the house this week) I might have been able to get away with leaving the jelly out on the counter once it was opened. It wasn’t all bad. I did get to have Split Pea Soup twice this week, thank goodness for that because I am not feeling all that great. And I was able to make hot tea and use honey since neither are kept refrigerated. I really thought that I would be going to the store more often throughout the week in order to get new food but things got crazy and I haven’t been out of the house since Tuesday – that is what happens when you work from home and are a Blogger your day starts early and ends really late so without kids to pick up at school or after school practice getting to the store doesn’t necessarily happen on a specific day. I do need to fess up and say that we (as in the girls and I) ate out one night for dinner. I woke up earlier this and Indiana had an upset stomach she was fine otherwise. Her tail was up she was happy and so I gave her some “tummy medicine” we call a lick of honey tummy medicine no treats or food just full access to water. By the end of the day she was still acting fine and had not gotten sick again but instead of chancing her getting really sick in the middle of the night I opted to get the dogs some boiled chicken and Broccoli with plain rice for dinner and since I was getting them something I got myself something too. I also want to point out that even though the dogs got to have Freshpet Dog Joy Cookies with Pumpkin Cheesecake Icing I did not partake in any of the cream cheese while making the icing for the cookies. I knew by the end of the week I wouldn’t be feeling awesome I really need fresh salmon at least twice a week and fresh eggs at least a few times as well. I did have canned salmon last night only to realize I couldn’t make salmon salad because the only mayo in the house was in the fridge so food was just not as exciting or tasty as normal. And while I rarely put cereal in almond milk or skim milk because I couldn’t I really wanted to. I did heat up corn tortillas for lunch 2 times this week and put peanut butter and honey on them which was really good and something I will likely do in the future when the challenge is over most of what I ate this week I don’t think I will recreate. While our challenge continues I thought now would be a great time to start our Giveaway so that you can try Freshpet food for your dog or cat! 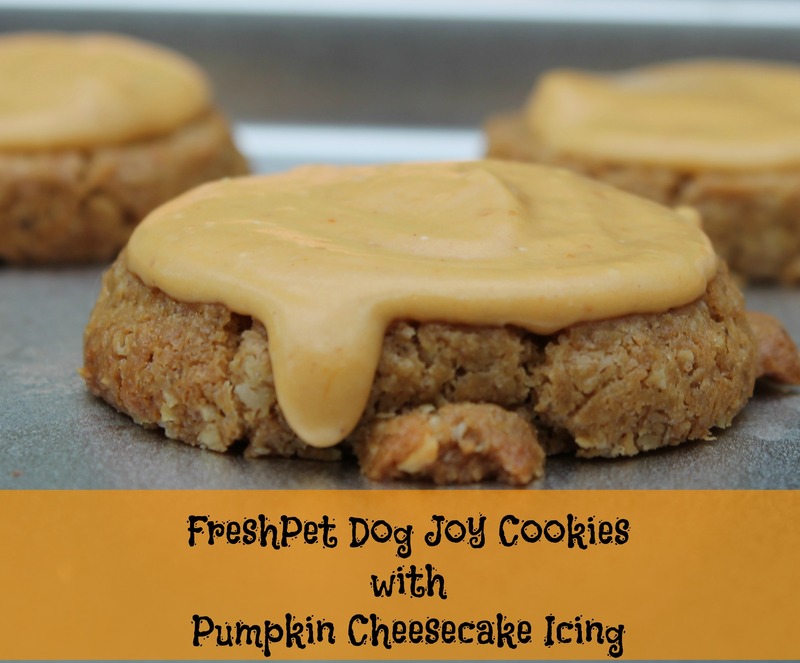 I do know that I will be buying more of the Freshpet Dog Joy Cookies and coming up with fun icing flavors to make for the dogs. In fact I want to make a special batch the night I get locked in the shelter (you know that challenge I told you about a few weeks ago? well we made our goal of 175 bags of dog food so I will be spending the night) as a special treat for all of the shelter dogs. To learn more about Two Little Cavaliers and their Fridge Challenge week, be sure to view their website here. Can You Live without the Fridge for 7 Days? We thought it sounded like a pretty interesting challenge so we agreed to do it and share the challenge with all of you. While there is no padlock on the fridge we were asked to use it as little as possible in order to really think about the difference between fresh food and the alternatives available. For me it means no fish for dinner unless it comes out of a can and well canned salmon is not as appealing as a fresh cooked piece of salmon. It also means no eggs for breakfast – expect on the day that I go and pick up our farm fresh eggs from the chicken lady she is available at the farmers market only once per week. Since the dogs are still getting their cold filter water that means I get to have cold filtered water too (hey it is only fair that any time they get something from the fridge I do too.) It means no frozen vegetables to add to those cans of beans to make a more hearty dinner – even if they did make it canned broccoli just doesn’t sound appealing. To gear up for the challenge I purchased a bunch of cans of chick peas, corn, and salmon. I also picked up a few bags of slit pea soup (the kind found in the kosher section where you start with the dry split peas.) While I could go out and get take out or have food delivered I felt that actually trying to stick with the Freshpet Fridge Challenge would be more interesting and make me really think about how I want to feed Davinia and Indiana in the future. For breakfast today I had Hot Tea and dry cereal. For lunch I had grits seasoned with salt and pepper, and tonight for dinner I am looking forward to Split Pea Soup. The girls love to have carrots from the soup so I bought a bag of carrots which I will throw in and once they are cooked will fish out and give to them. 1. We are a dry kibble household but that doesn’t mean that Davinia and Indiana do not get fresh food they just do not get food from the fridge on a daily basis. They get homemade treats, bites of my dinner (sometimes), and they occasionally share an egg breakfast with me. Since we are taking the challenge and I know from past experience with them that Davinia and Indiana really like their Freshpet Dog Joy Peanut Butter Oatmeal Cookies I decided to buy a package to use this week. I am the one taking the fridge challenge not the dogs and so I thought it would be fun to use the cookies in a recipe for our recipe this week. For those of you who aren’t bakers or get scared in the kitchen this recipe is for you! 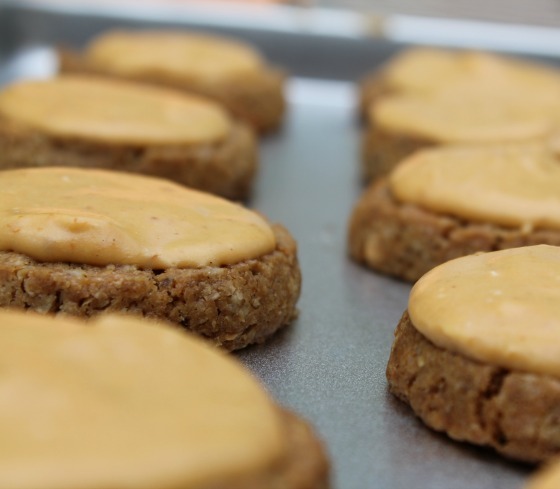 It starts off using Freshpet Dog Joy Ready to Bake Peanut Butter and Oatmeal Cookies. These cookies are much like cookie dough for people only they are made for dogs. They come pre-cut so all you have to do is pull out a baking sheet and throw them in the oven. The ingredient list will not have you cringing about cooking dog food in your oven. Preheat oven to 350° F. Place cookies 2″ apart on ungreased baking sheet. Bake for 10 minutes or until cookies are lightly browned. While the cookies are baking in a microwave safe mixing bowl add the cream cheese and pumpkin pie mix and stir with a spoon or fork. You will notice that the cream cheese is still clumped together. Place in the microwave for 15 seconds remove and stir well. You will probably need to put it in for another 15 seconds before you are able to combine the two ingredients without lumps. Take the cookies out of the oven and cool completely on baking rack. Once cool take the spoon or fork you used to mix the pumpkin cheesecake frosting and frost the cookies. All the cookies to sit so that the frosting has a chance to set. You might want to place them in the fridge or freezer to help them set faster. This is a sponsored post on behalf of FreshPet for the #FridgeChallenge. All thoughts, ideas, and opinions are our own. To learn more about Two Little Cavaliers and their Fridge Challenge week, be sure to view their website here.